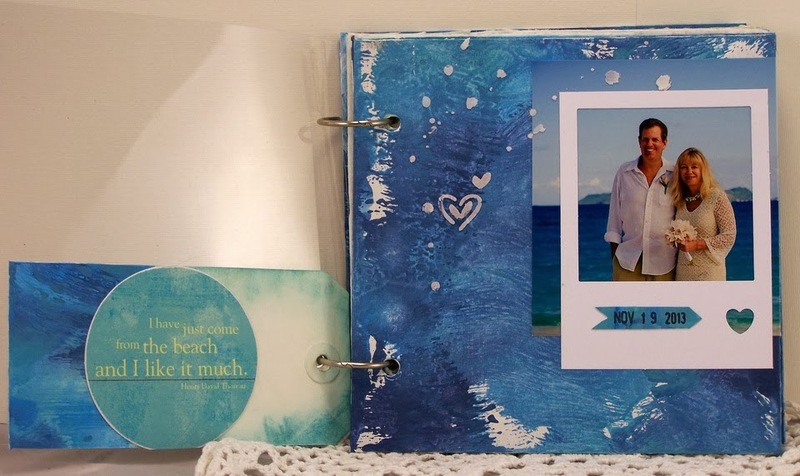 So I made this mini album for him with photos from our ceremony and used distress paints and embossing pastes and stamps and stencils. 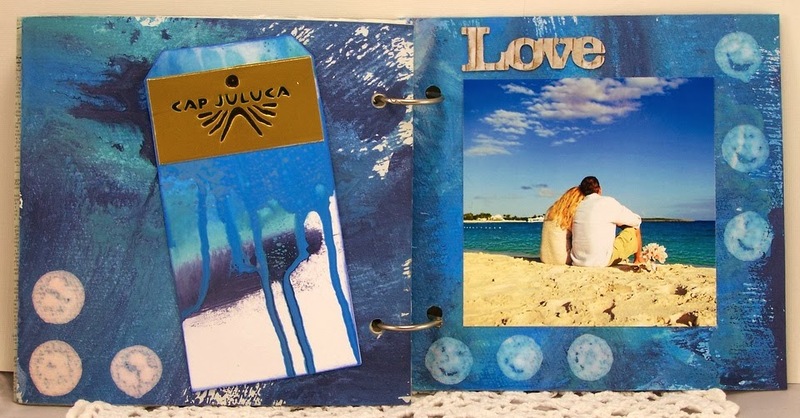 I will point out the products I used for each page that you can purchase at the eclectic Paperie Shop. WARNING ~ LOTS of photos! The first page is acetate so I put a tag on the front and also on the inside of the acetate to prevent the glue from showing. 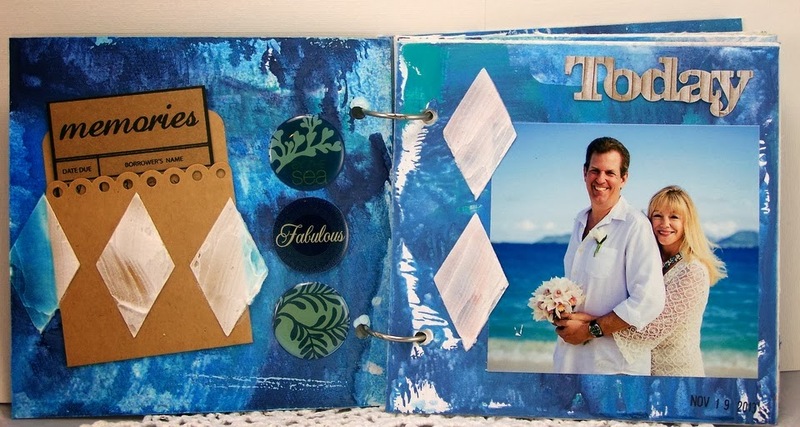 The 25 numbers are Tim Holtz Alpha Parts numeric. I used TH Distress Paints on the tag AND on the plastic numbers. I sanded the paint on the numbers when it was dry so some of the black plastic would show through. The left shows the tag (Distress painted AND Distress inked in Evergreen Bough ~ LOVE ~) and a chipboard coaster from my stash that I bought years ago. 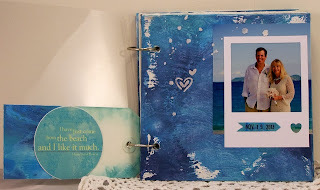 The right page BG is TH Distress Paint with my FAV TCW Confetti Stencil and Wendy Vecchi embossing paste so I could have hearts by our photo ~ which I framed with jillibean soup's white frame. It already had the heart cut out! I used a date stamp and made a banner pointing to the heart. Here's the coaster up close so you can read it and see the marbeling in the distress paint. On the left I added beach things from my stash and used my new Prima Harlequin stencil with Wendy Vechhi embossing paste ~ LOVE both! On the right I added more harlequin shapes with embossing paste and added the word "Today" with my jillibean soup corrugated shape words. 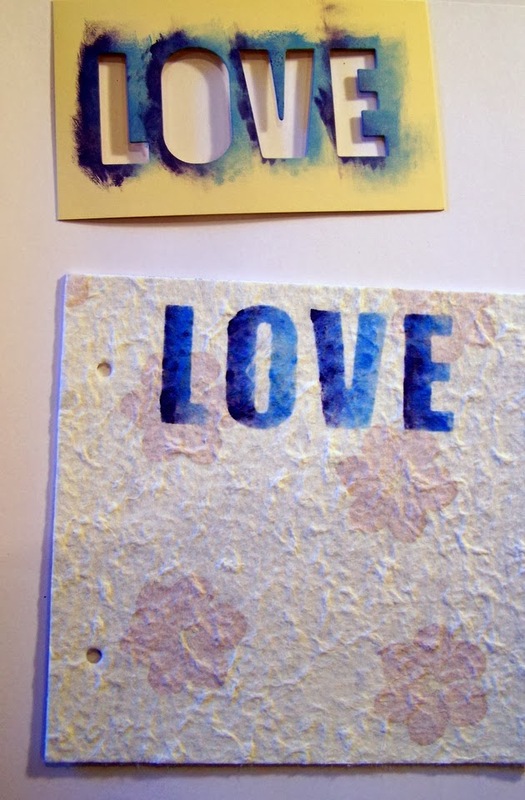 On the right I used Distress Paint through my Fancy Pants Stencil Cards and added Distress Paint to the envelope. Here is what the tag says. I don't know who the author is - Sorry! 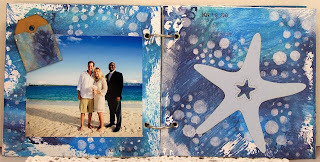 Same BG for both but I added white gesso through my new Prima Bubbles Stencil. My thought - bubbles ~ water ~ snorkeling! THAT'S how MY mind works! This is a photo with the minister and the starfish is from my beach stash. 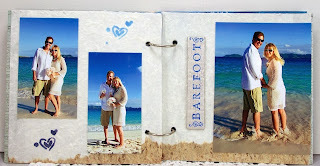 Here are photos of us barefoot in the water. 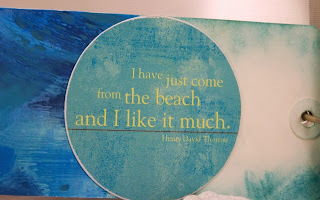 (Sticker word from beach stash). Hearts added by dabbing distress paint with a sponge through the same Confetti stencil I seem to use All The Time! Same Distress Painted BG. 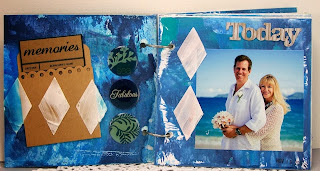 The white circles were made by dabbing the white distress paint applicator tip directly onto the page. I used another jillibean soup corrugated word ~ "Love." Cap Juluca is where we stayed and where the ceremony took place. The "LOVE" is an OLD Rusty Pickle (remember them??!!!) 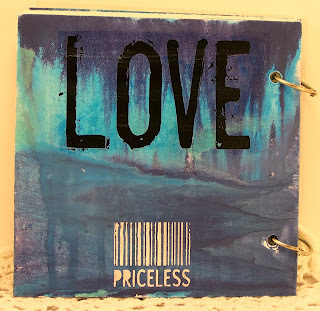 rub on I have had Forever and the "Priceless" is my other FAV Wendy Vecchi Stencil called barcodes ~ LOVE LOVE LOVE! 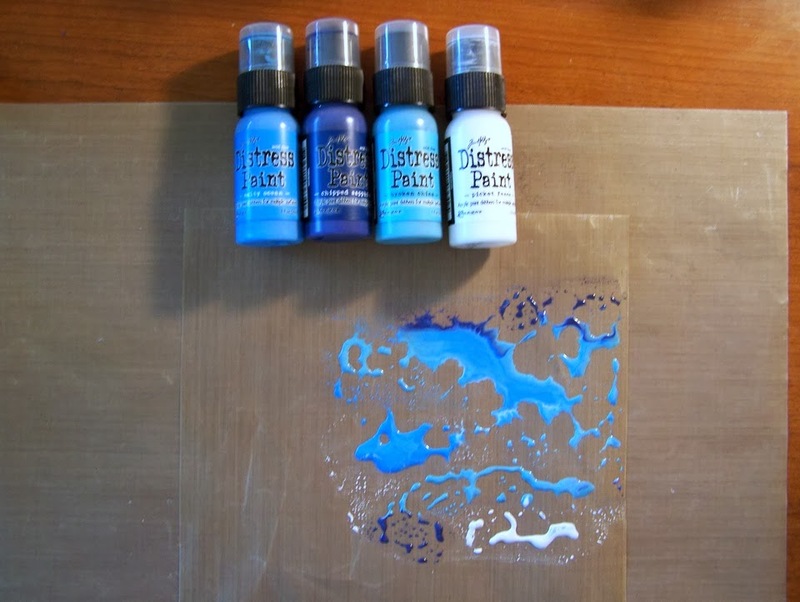 More Wendy Vecchi embossing paste!! 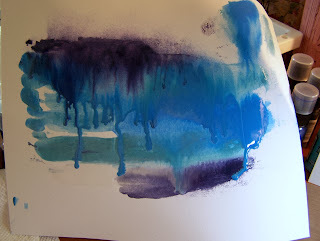 These are the colors of Distress Paints I used. (YES, I cut a second craft mat so I could put paint on one that was small and use the large piece for other steps). Here's a photo of the distress paint running after I spritzed it with water. 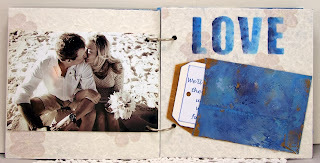 Here is the Fancy Pants Stencil card I used for the "LOVE." 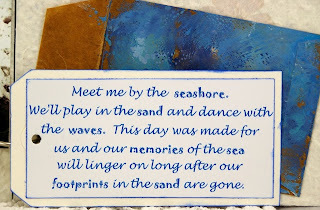 I used several shades of blue with the darker shading on the left hand side of the letters. 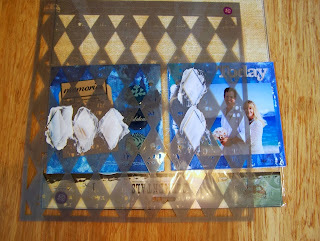 Here is how I applied the Harlequin shapes with the Prima Harlequin Stencil and embossing paste. I can't WAIT to give this to my husband for Christmas! It's the least I can do for him since he planned this entire trip around our actual anniversay, bought my dress, arranged for a minister, photographer, and flowers, and made reservations for dinner at the resort for that evening! The day could not have been any more perfect, nor could the entire trip! 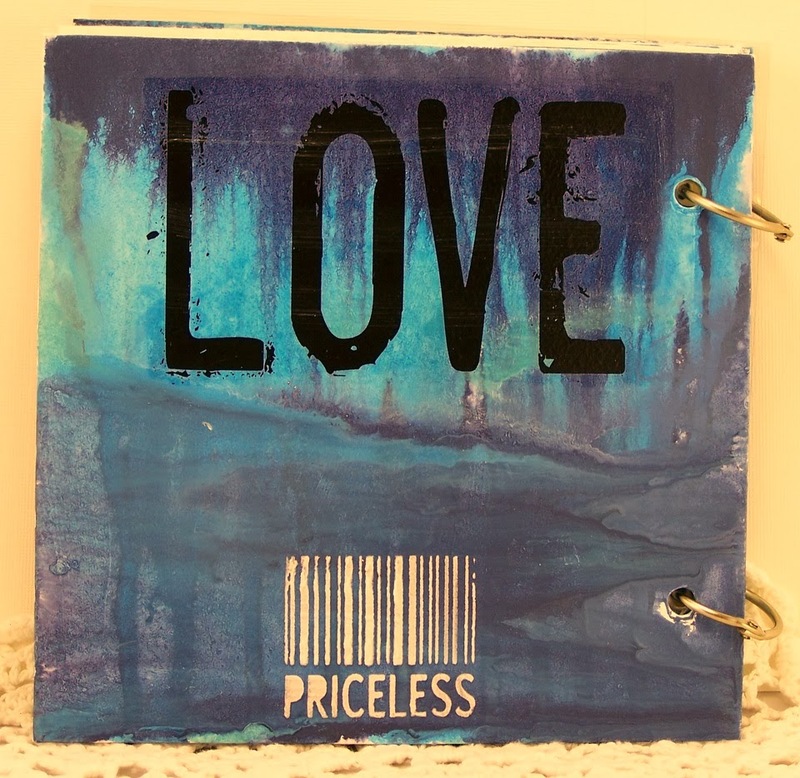 I almost LOVE my Tim Holtz Distress Paints as much as him! LOL! Sue, it is gorgeous!! He is going to love it - amazing! Thank you so much for sharing your work - I LOVE it! What a special gift for an awesome husband! You are indeed blessed! 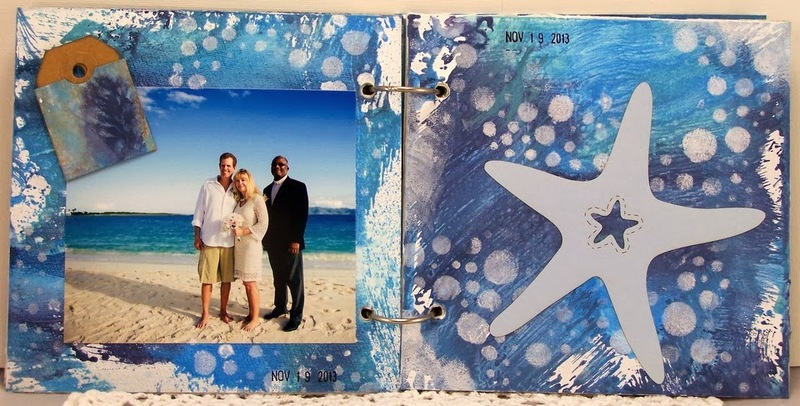 And I love all the details you shared in creating this momento of the occasion. Sue that is a beautiful album. 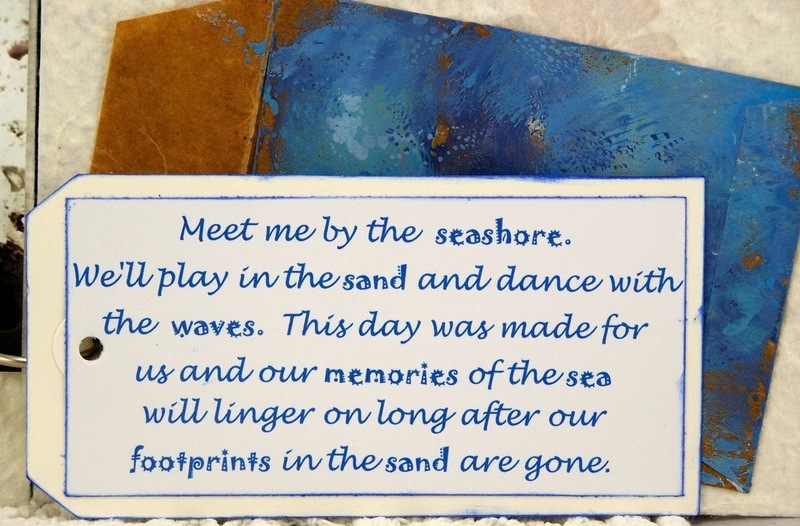 The paint colors, the stencils....all bring to mind the ocean!!!!! 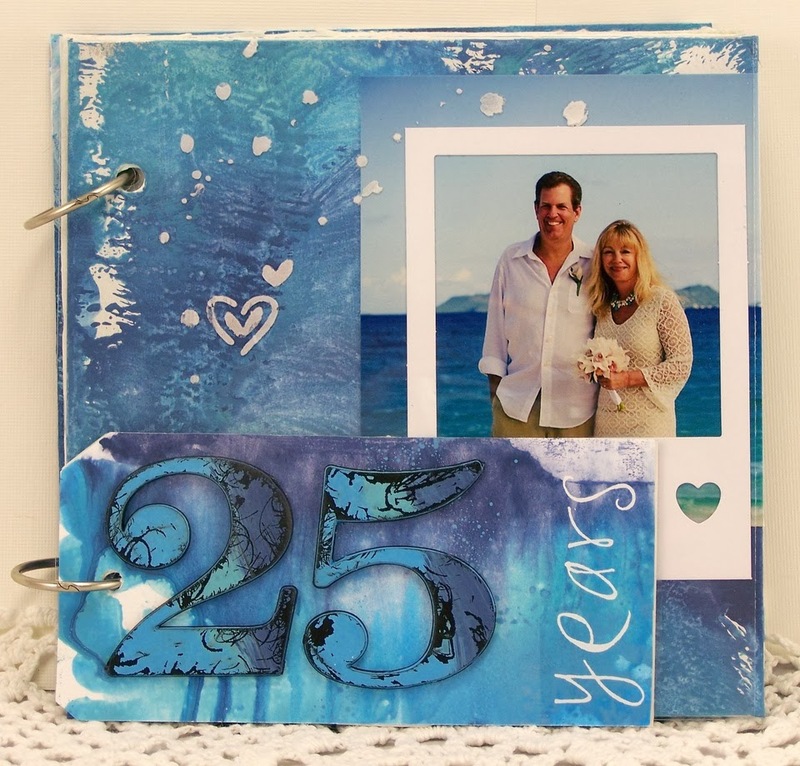 And love the photos and a big kuddos to your hubby for planning this romantic 25th anniversary! What a treasured album this must be! Sounds like a magical trip, as well. Happy Anniversary.